Well technicality I suffer from ptsd. Medically solved with a toke of Kosher Kush. ..Makes you wonder how anyone survived the hell of the trenches of WW1 or the tough fighting in WW2, Korea, and/or Vietnam..
Yeah, PTSD seems to be a new invention.. I mean, police and medics see churned-up dead bodies on a daily basis in car smashes and industrial accidents etc, but as far as I know they don't go down with PTSD. Well, shellshock and combat fatigue are real conditions, but pretty select ones. I blame over-exposure to the description of the condition, and under-exposure to what is going to be encountered. I spent thirty-odd years in law enforcement and saw a great deal of horror, but I expected to see horror. I never considered PTSD until late in my career when they started holding classes on it. What they taught us was that it was a passing thing, and the best ways to deal with it was to talk it out, keep busy, and do not self medicate. DoD, on the other hand, seems to be indoctrinating the troops that PTSD is inevitable, unavoidable, and a life-long condition. I helped fish a four-year-old out of the septic tank he drowned in. For years on my drive to and from work I passed a row of septic tanks in the lot of a plumbing company, and every time I looked at them I thought about that afternoon. Is that PTSD? No. Its just memory. And memories fade with time. You'd claim menopause if no other excuse offered itself. I'm not a big believer that most, or even a large number of veterans, have PTSD. I think it's become the "disability de jour" for getting benefits. First, less than 10% of veterans ever see actual combat. It has become something of a cottage industry to not only say you have it, but even to fake it. There's plenty of sites on the Internet that will coach you through getting the VA to certify you have PTSD and qualify you for a lifetime disability payment. So, the vast majority of veterans in the military never experience anything service related that would cause them to suffer PTSD that was part of their duties. I've seen, or been involved in, in what in the civilian world would be called "industrial accidents." Shipboard fires? A number ranging from minor to pretty serious, including one that was a radcon (radiological) fire. People getting torn up on machinery, etc. More than I care to recall. I've seen auto accidents that are equally bad, or worse. I was never in combat, not even close. But, I bet with some coaching I could claim PTSD today with the way the system is set up. Would I? No. Why should I cheat the system? I wonder if the trrops who are most prone to 'PTSD' are those without any spiritual side to their nature to act as extra "body armour"? Citation- "For conspicuous gallantry and intrepidity in action at the risk of his life above and beyond the call of duty. Chaplain Watters distinguished himself during an assault in the vicinity of Dak To. Chaplain Watters was moving with one of the companies when it engaged a heavily armed enemy battalion. As the battle raged and the casualties mounted, Chaplain Watters, with complete disregard for his safety, rushed forward to the line of contact. Unarmed and completely exposed, he moved among, as well as in front of the advancing troops, giving aid to the wounded, assisting in their evacuation, giving words of encouragement, and administering the last rites to the dying. When a wounded paratrooper was standing in shock in front of the assaulting forces, Chaplain Watters ran forward, picked the man up on his shoulders and carried him to safety. As the troopers battled to the first enemy entrenchment, Chaplain Watters ran through the intense enemy fire to the front of the entrenchment to aid a fallen comrade. A short time later, the paratroopers pulled back in preparation for a second assault. Chaplain Watters exposed himself to both friendly and enemy fire between the 2 forces in order to recover 2 wounded soldiers. Later, when the battalion was forced to pull back into a perimeter, Chaplain Watters noticed that several wounded soldiers were lying outside the newly formed perimeter. Without hesitation and ignoring attempts to restrain him, Chaplain Watters left the perimeter three times in the face of small arms, automatic weapons, and mortar fire to carry and to assist the injured troopers to safety. Satisfied that all of the wounded were inside the perimeter, he began aiding the medics--applying field bandages to open wounds, obtaining and serving food and water, giving spiritual and mental strength and comfort. During his ministering, he moved out to the perimeter from position to position redistributing food and water, and tending to the needs of his men. Chaplain Watters was giving aid to the wounded when he himself was mortally wounded. 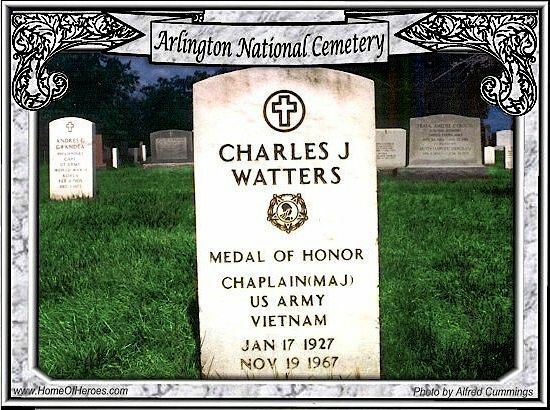 Chaplain Watters' unyielding perseverance and selfless devotion to his comrades was in keeping with the highest traditions of the U.S. Army"
Terrible events do exert terrible pressures, but a firm foundation can weather any storm. Those without a spiritual core tend to be very, very brittle, and break easily. Or crumble away under the onslaught of horrible things seen over and over. Holy crap, fellows. Has this become a PTSD bashing thread? Comparing any civilian job to fighting in the Surge in Baghdad is shaky at best. Questioning whether soldiers or Marines actually have PTSD or may be faking it is much too harsh. I would argue for giving them the benefit of the doubt. There but by the grace of God, go I.
BTW since some of the commenters appear to have not seen the movie, the two main characters are certainly suffering from PTSD. They are clearly not faking it. They both try to hide it and only reluctantly turn to the VA for help. Schumann sees one of his mates shot in the head and then when carrying him down the stairs drops him on his head. He also is replaced on a mission by a soldier who is killed by an IED. To make matters worse, Schumann was an explosive ordnance disposal specialist who naturally felt he would have seen the IED if he had been in the humvee. He combines PTSD with survivors guilt. I don't mind turning my thread into a discussion comparing PTSD to battle fatigue to shell shock, but to question whether some soldiers in Iraq legitimately suffer from PTSD is uncalled for. Shame on you. So how do you explain much bloodier wars producing much fewer PTSD victims? Or mechanics whose battalions never saw action drawing disability for PTSD? Life is not like movies. One buddy killed and a guy gets PTSD? Please. And we're not accusing soldiers from Iraq, we are mocking a movie. Movies are not real, and nearly all war movies are extremely lame at best. Last edited by Arnold J Rimmer; 06 Nov 17, 19:05. Absolutely true.it's fashionable these days to discount and even sneer at a Christian upbringing, but the Jesuits and St Francis Xavier, were onto something in their mantra (paraphrasing) "Give me any child up to the age of seven:- and I will bring you the man". 1. So how do you explain much bloodier wars producing much fewer PTSD victims? 2. Or mechanics whose battalions never saw action drawing disability for PTSD? 3. Life is not like movies. One buddy killed and a guy gets PTSD? Please. 4. And we're not accusing soldiers from Iraq, we are mocking a movie. Movies are not real, and nearly all war movies are extremely lame at best. 1. "PTSD affects about 30 percent of Vietnam veterans, 10 percent of Desert Storm vets, upwards of 20 percent of those who served in Iraq and 11 percent of Afghanistan combatants, according to the national PTSD center." I know by "bloodier wars" you are referring to the World Wars, but Vietnam would be the most comparable and it ended over 40 years ago so it is not recent. As far as the World Wars, I am not going to argue that the soldiers were the same in how they responded to combat stress. Obviously, Americans were tougher back then and less likely to succumb to PTSD. However, they were also less likely to reveal problems so we can't be completely sure what percentage suffered from PTSD. Officially it is 5%, but some estimate it at as high as 30%. If it is around 5%, one possible caveat is that a smaller percentage of soldiers saw combat than in the modern army in Iraq. 2. I'm not going to argue that modern American young men are tougher than the Greatest Generation, but the Red Ball Express did not have to worry about IEDs. There was a front line in both World Wars. This was less true in Vietnam and Iraq. 3. What makes you an expert on what causes a person to crack? You should be more empathetic. In the case of Schumann, being a Explosive Ordnance Disposal Specialist could induce PTSD even if he had not had the two incidents depicted in the movie. Do you think UXB specialists in WWII were immune to PTSD? 4. It sure sounds like you are criticizing soldiers and Marines in the current military. The movie is not fictional, but even if it was it depicts a problem that all experts agree exists. I won't even bother to respond to "nearly all war movies are extremely lame at best". I'll bet you didn't find the scene where Patton slaps the "coward" to be lame. You probably stood up and cheered. Yeah, some crumble and some don't. Having a spiritual mindset doesn't make people immune to the hard knocks life throws at us, but it does help us roll with the punches. A non-spiritual person is like a wagon without springs, jolted by every pebble on the road. In fact it's not just servicemen who get knocks, it's ordinary civilians too, for example those with lifelong physical or mental handicaps or illness, for whom every day is a never-ending battle, year in year out. I'm not saying genuine PTSD doesn't exist, just that it's a label that's bandied around too freely and I wish an indepth study was done to answer questions such as whether some servicemen are more likely to get it than others, and whether enlisted men or officers are more likely, and whether other nations armies get it too. PS- I read a news report that a lot of our military drone pilots are resigning because of the "stress" of having to kill terrorists! They gotta be friggin kidding us! Below: US troops recharge their spiritual batteries at a field service after capturing Baghdad International Airport in 2003. Knowing that the Big Man has got their backs kinda gives troops an edge..
..to destroy the whole country..
Last edited by Poor Old Spike; 06 Nov 17, 20:58. 1. "PTSD affects about 30 percent of Vietnam veterans, 10 percent of Desert Storm vets, upwards of 20 percent of those who served in Iraq and 11 percent of Afghanistan combatants, according to the national PTSD center." I know by "bloodier wars" you are referring to the World Wars, but Vietnam would be the most comparable and it ended over 40 years ago so it is not recent. As far as the World Wars, I am not going to argue that the soldiers were the same in how they responded to combat stress. Obviously, Americans were tougher back then and less likely to succumb to PTSD. However, they were also less likely to reveal problems so we can't be completely sure what percentage suffered from PTSD. Officially it is 5%, but some estimate it at as high as 30%. If it is around 5%, one possible caveat is that a smaller percentage of soldiers [saw combat than in the modern army in Iraq. The modern army in Iraq had the highest 'tail-to-tooth' ratio of any force fielded by the USA to date. The cash incentive to parrot PTSD symptoms has already been mentioned in this thread. Like I said, we recently jailed a guy on 50% PTSD disability who served in Iraq as a welder in a battalion which never took a single causality. They also didn't have pizza and Starbucks stores on their bases, either. Thirty-plus years of seeing terrible sights weekly if not daily. Seven LE Purple Hearts and one Wound Medal (two different agencies). It isn't theory with me: I know what this stuff feels like. Maybe not as much as Trung Si, Jeff doorgunner, 101cv, or our own WW2 vet, but I have seen a great deal. I met the guy he slapped. He was a janitor in the town I grew up in. I also dump on the Marines whenever the Navy or Air Force is not handy. As to the 'experts', you have not produced any, and the odds are I would not find them credible, any more than I find credible 50% or more of the PTSD claims submitted to the VA. BTW, there are people pointing out that widespread fraud is hindering actual victims of PTSD in getting treatment. The movie was just that: a movie, intended to make money. Around the first of the year I'm going to be testifying in a case where a mother dunked her baby in boiling water because it cried too much. This and the use of clothes irons is so common that this type of case gets its own chapter in most first line works on child abuse investigation. You ever seen an infant who's been boiled? They lose the ability to scream; all they make is this whistling noise, similar to the noise a squeeze bottle of mustard makes when there is no mustard left. I can't tell you how many kids I've seen like that. Movies are just stories told to make money. War Movies tend to follow the same lame script: the hero who bleeds out gasping some profound, meaningful wisdom or heart-touching farewell, the goober who makes good, the good soldier who loses himself, and the iron-jawed natural leader who is marked by the war but manfully rallies before the credits roll. This particular film was just from the same stereotypes, had the same pacing, and pushed the same buttons. It was hackneyed at best. It's good that you liked it; war movies are your thing and I don't disparage any man's non-criminal hobbies, but if you're going to gush about them here, brace yourself for counter opinions. Well, yes. Some vets never left the wire and are getting 100% disability for PTSD. I will not judge them because the VA has a pretty good screening process and board of review, not easy to fake. As far as WW2 and Korea it was a different ball game. Vietnam was a mess, and many vets had the same issues, you just didn't hear much about what they went through during the period. Restrepo is probably about as good as it will ever get.